“If you do not believe in magic, your life will not be magical”–Lynn V. Andrews. Since this is the month of leprechauns and fairy wings, let’s dwell on the magic we allow into our lives. Yes, allow. If you aren’t open to an idea, you stop it from manifesting in your life. If you can’t believe something is possible, no matter how much you think you want to believe it is, you won’t be able to create it. So are you open to viewing the world a bit outside the box to allow for some magic? Similar to other children, I grew up with a fervent belief in all things magical. Houdini was one of my childhood heroes. My favorite childhood book was a book about elves, fairies and mermaids. I think it was The Golden Books Treasury of Elves and Fairies or The Giant Golden Book of Elves and Fairies with assorted Pixies, Mermaids, Brownies, Witches, and Leprechauns by Jane Werner. Unfortunately, it didn’t survive my childhood. From the comments on Amazon for the second book mentioned, I have to believe the illustrator’s magical drawings affected more than just me as a child believing in magic. One small mention of “the book” to my oldest sister and she went off on a tangent about the mermaids in the book. My special memory was a depiction of an elfin family beneath a tree. No space went unused. There was a loaf of bread stored in the crevice of one root, and others were used as furniture. I could get lost in that illustration and I did many times as a child. My next favorite mystical book was a garage sale purchase in my early teens: The Complete Illustrated Book of the Psychic Sciences by Walter B. Gibson & Litzka R. Gibson. My favorite section was divination by dice. You ask a question from a list of 1-30 and then the toss of two dice dictated your answer. I asked and asked and asked, pondering life as a young teen. Did you get that? Mysterious manifestations are natural. Yes, I’m sure this statement had an effect on me in my early teens, and perhaps was the first seedling planted in my psyche to check out this thing called yoga. “One of the earliest written references to fairies is in Homer’s Iliad, (Written 800 B.C.E.!) in which he talks about ‘watery fairies dancing in mazy rings,’ while in his Odyssey he tells of “fair-haired dryads of the shady woods”. ..No one knows when a belief in fairies began, but the legends of indigenous peoples whose traditions survived for thousands of years in song and story tell of encounters of fairy kingdoms. What is most surprising to skeptics in that fairies from different parts of the world and from different ages have common characteristics in legends with no apparent geographical connection. Fairies are found in mythologies throughout the world. Especially rich in fairy lore are Brittany, Cornwall, Ireland, Isle of Man, Scotland and Wales, the Mediterranean lands, Germany, Eastern Europe and Russia, Scandinavia and Iceland. These fairy traditions—and some believe the fairies themselves—travelled with the colonists to the USA, Central and Southern America, Australia, New Zealand and South Africa.” A Complete Guide to Faeries & Magical Beings by Cassandra Eason. Cinderella—The 1965 TV-version starring Lesley Ann Warren. I sang “In my own little corner, in my own little chair” over and over and over. Didn’t every little girl want to believe in a fairy godmother sending you to the ball with a new wardrobe? The Wizard of Oz had me believing in a place far away over the rainbow where wizards and good witches helped you find your way home along with your good friends—the talking scarecrow, tinman, and lion. Will you ever doubt you have the power within you after hearing it from Glenda, the good witch? The above two examples lead me to point out that the purpose of fairy tales has been to see the hidden message within a story, often based in fact. Tales such as these have been told since time began. They open us up to receive the lesson in a non-threatening way—to encourage us to listen. Every little girl deserves to believe she “can be whatever she wants to be” and that “you have the power within you all along”. Eddie Albert appeared in a movie called The Borrowers released in 1973. He was the father of the “inches-tall Clock family” that scrambled to avoid being captured after being discovered by a visiting boy from the “big people” peeking under the floorboards in the Victorian mansion they lived in. Since it was the magic of the upcoming St. Patrick’s Day holiday that inspired this newsletter, I can’t forget one of my absolute favorite movies to celebrate Saint Patrick’s Day—Darby O’Gill and the Little People! “The history of leprechauns is filled with mystery, ancient tales and surreal incidents, but reports are conflicting. It’s hard to know which part is fact and which part is fiction. The only thing that is a sure bet is that the history of the Little People is surrounded by magic. According to local Irish folklore, the history of leprechauns has its beginning in magic. The general belief is that leprechauns are descendants of the Tuatha De Danaan, who were the people of the Goddess Danu. The Tuatha De Danaan were a group of magical beings led by Lugh the Long-Armed Warrior, who used a rainbow as a sling weapon. Based on facts and stories that have been passed down, some people believe that leprechauns are magical creatures that do exist. Others believe leprechauns are simply creatures of imagination. Magical creatures can be anything an individual wants them be: fact to some and fiction to others. I had to believe in leprechauns—I lived in South Bend, IN growing up, and my Dad was a fervent fan of Notre Dame’s fighting Irish—with the leprechaun as their mascot! If they didn’t win, he was NOT a happy camper! Come on now. How many of you clapped for your belief in Tinker Bell, or checked under your pillow to see if the tooth fairy made a visit? I don’t have to tell you I still believe in Santa Claus (“a right jolly old elf” from The Night Before Christmas) if you read my Nov/Dec newsletter. How about you? Do you believe? Fun fact: Pioneering scholar Rosemary Wells, a former professor at the Northwestern University Dental School, found archival evidence that supports the origin of different tooth fairies in the U.S. around 1900, but the first written reference to one specific symbol in American literature didn’t appear until Lee Rothgow’s 1949 book, “The Tooth Fairy.” Considered the world’s tooth fairy expert, Dr. Wells even created the Tooth Fairy Museum in 1993 in her hometown of Deerfield, Illinois. But according to the local library, it evaporated after her death when her husband liquidated all her memorabilia. It was these early childhood influences that encouraged my deeply instilled belief in all things magical. They were the stepping stones to the “magic” of energy healing, like Reiki and Ortho-Bionomy—both of which I’ve trained in. Once you start to realize that everything is energy, the things we thought of as “magic” start to become quite believable. For example, what is the placebo effect if not the body believing in the cure and then producing what it needs? It’s the energy of belief that is the major healing factor here. Is the healing any less real? Are you open to the possibility of energetic healing? I suspect when push comes to shove, and all current medical options have been exhausted, you would be. So why not open to other energies? My continued belief in the possibility of the existence of the wee ones—be they fairies or elves—was further fueled by finding the book, The Coming of the Fairies by Sir Arthur Conan Doyle, best known as the author of Sherlock Holmes. It was his “unshakeable belief in the spirit world” that prompted him to write the book. It’s a story of the “Cottingly fairy photographs” and it is “proof of mankind’s willingness to believe” (quotes from the book.) Who am I to argue with the likes of Sir Arthur Conan Doyle? http://en.wikipedia.org/wiki/Cottingley_Fairies. If you consider me foolish, consider that Avatar, The Lord of the Rings, and Harry Potter all have appearances in the top ten list of highest grossing films. (http://en.wikipedia.org/wiki/List_of_highest-grossing_films ) Don’t they all have something to do with magical happenings, elves, or fairies? We are a society positively enamored with magic, and would you have it any other way?! “Indeed it might be said that if you inhabit a place where there is no room for magic, it is not good for people either.” A Complete Guide to Faeries & Magical Beings by Cassandra Eason. So before you write it all off as whimsical nonsense, consider the quote from my favorite early-teen book which succinctly reminds us that mysterious manifestations are natural. http://www.sacred-texts.com/neu/celt/ffcc/index.htm . Yes, you read that right. It says doctoral thesis! This very interesting work reviews all aspects about the little people, and it’s still in print. http://www.sacred-texts.com/neu/celt/ffcc/ffcc411.htm#page_456 . Both very well put, don’t you think? It’s no secret that one of my absolute favorite authors is Ted Andrews. I’ve mentioned his books on animal totems and nature many times. He has authored several books that have piqued my interest. So when I found one entitled Enchantment of the Faerie Realm, I devoured it. This wonderful book is yet another way to connect with nature and in being open to the magic that awaits you in nature, if only you let it. Ted Andrews first introduced me to the concept of “the ‘tween times’—times that are not distinct or definable—they are in-between. Dawn is neither day nor night, and neither is dusk. Noon is neither morning nor afternoon, and midnight is neither one day nor the next. Equinoxes and solstices—especially autumn and spring are also “tween time””— Enchantment of the Faerie Realm. A partial list of “tween places” from this book includes: Where streams divide, intersections of roads, beaches and seashores, fences and border hedges, thresholds, and stairwells, landings and hallways. The “tween times and places” are the best times and places to be open to the magic. So—full disclosure— this leads me to share my own “tween time/place” story. Fair warning, I know this may sound a bit crazy to some of you; but now that I’ve warned you, you get to choose to be open to the magic. My husband and I were in the process of moving to Minnesota from Wisconsin about 17 years ago now. It was a time of big change for us. He was to develop a fairly new sales territory in the Minneapolis area, and I looked at the move as a new beginning too. One evening I was in Madison getting ready for the movers to come the next day. Ed was already in Minnesota establishing a place to live and becoming acquainted with his new territory. So I was alone. There were some items I didn’t want to be without that I was going to pack away in my car for my drive to Minnesota the next day. I decided to place them in the front of the fireplace in our kitchen, in the hearth area (which in retrospect was its own “tween place”—neither in the kitchen nor in the fireplace). I was in an expectant mood, perhaps a bit anxious, knowing that this was the end of our time here in Madison, which I dearly loved, and the beginning of a new adventure. It was late in the evening so I had the lights on in the kitchen, i.e., no chance of sun reflections from outside. At the time I was not dwelling on anything but packing and the move ahead. All of sudden, out of the corner of my eye, I saw what appeared to be a little glowing ball bouncing in the area of the hearth. I giggled a bit wondering “What the heck is this?” and walked over. As I caught it in my gaze again, it jumped behind a paper bag I’d placed in the area as if to try to elude me. A couple of jumps and I could no longer detect where it was. I was never scared. I knew what I saw was real and I was not imagining it. I didn’t know exactly what it was, I only knew that it was real and I felt truly honored to have witnessed it. Apparently, Fairies often make themselves known as sparkling balls of light. The Complete Guide to Faeires & Magical Beings by Cassandra Eason refers to these as “earth lights”. For the longest time, I only told my husband. Once, he tried to bring it up among friends, I quickly changed the subject and told him later that this is NOT a subject I tell just anyone. After all, not everyone knows me well enough to know that I don’t make this stuff up, and sometimes no matter how well they know me, they won’t be open to believing the story. So please know, dear reader, that I offer my “tween time/place” moment with a full heart knowing full well there will be some or many of you who will think I’m nuts. But just as yoga opens you up to the awareness of your full potential both physically and spiritually, I hope to share my experiences with the magical moments in my life to open you up to a “world full of color and joy and wonder”—Ted Andrews—or at least give you reason to pause. I am currently participating in a second 200-hour yoga teacher training with TeriLeigh Schmidt. TeriLeigh has studied extensively with West African Shaman, Malidoma Somé. In 2009, she was initiated as an Elder into the Dagara Tribe of Burkina Faso. The cosmology of the Dagara Tribe teaches the value of spiritual ritual, relationship to ancestors, and the healing powers of five elements: fire, water, earth, mineral, and nature. The elements also make their appearance in the world of the “little people” as “Elementals”: There’s an elemental spirit of the Earth, Air, Fire, and Water. “Sometimes Archangels take on this role: for instance Michael, Archangel of the Sun, is linked with Fire, and Gabriel, the Archangel of the Moon, with Water. Rather than being creatures with a permanent form, the elementals are the forces or energies that in nature and magic give shape to living things and bring thoughts and desires into actuality, for example seeds into flowers and trees…They take on a particular form for a particular task…The elemental beings, as manifestations of these forces, are believed to occupy a kingdom between the material and spiritual plane and so act as a bridge between the two dimensions. The four elements can be regarded as one of the focused energy sources that for centuries were believed to be the building blocks of life.” A Complete Guide to Faeires & Magical Beings, by Cassandra Eason. TeriLeigh had mentioned in an earlier workshop prior to the start of the teacher training program that her teacher, Malidoma, had told her that the events portrayed in the movie, Avatar, are commonplace in his tribe. “Among the Dagara of Burkina Faso there is no distinction between the natural and the supernatural: The living converse with ancestral spirits, and those with the proper knowledge routinely travel to other worlds.”—Robert Bly testimonial on the back cover of Malidoma’s book, Of Water and the Spirit. Involve yourself in some creative activity on a regular basis. You don’t have to be an expert in it, but enjoyment of any creative activity will draw those of the faerie realm. I’ve also read that practicing meditation and yoga weekly, daily if you can, to boost your spirituality and enhance your mind is another way to prepare for the magic. Practicing outside so you can be one with nature is even better. To all unbelievers still reading, please re-read the list above. At the very least you’ll have spent time outside, added meditative moments to your life, created something you enjoy, added friends and spread smiles through your generosity, and giggled more than you used to. If that isn’t creating magic in your own life, I don’t know what is. So what’s so bad about that? “By reading what has been written about them in story, song and poetry, you send a message that you are open to contact. Just as with humans, if we show an interest in them, they will respond.” Enchantment of the Faerie Realm, by Ted Andrews. I’ve given you many resources here to start your research! I have not seen another “glowing ball” since that time many years ago, but I remember it with a smile. I still am not sure if it had a specific message for me other than to keep believing in the magic. Perhaps it only wanted to come along with me on my ride the next day. I’ve always secretly believed that. Perhaps I could view it to be a spirit guide of sorts. I don’t know. I only know that it ensured a continued growing belief in the magical mysteries life will bring if you are open to it. Perhaps it was my total openness to all things magical that allowed the magical visit. As Wayne Dyer, another favorite author, says, “you’ll see it when you believe it.” Happy sightings! I invited you in my opener to view life from a different perspective to allow some magic into your life. Inversions can give you a different view of your world. So I invite you to try the following simple inversion to do just that. (or use a block under the hands for support). Internally rotate thighs. Walk your fingers back to be in line with the toes if they aren’t placed there already. For an extra stretch, you can, walk your fingers back to be in line with the heels and use the traction of the mat to gently pull your torso toward the thighs—if it feels good—never force. Gently place your hands on the outside of the ankles. Grab your big toes with your index and middle fingers. Start with knees bent, and feet turned out. Then hinge at the hip and reposition feet once bent. If the block under the hands still leaves you rounded in the back, add a chair under your forearms. Add a flow—Twisting Straddle Forward Fold: Place your right hand palm down on the floor directly under your right shoulder to properly stack the joints for safety. If you can’t reach the floor, you can also use your fingertips or a block, and if you are working with carpal tunnel, you can use fists. Keep your spine parallel to the floor. Keeping your hips squared to the mat, inhale first while lengthening your spine. Exhale as you twist your mid-to-upper back and reach your left arm toward the sky. Use root lock to stabilize the pelvis, keeping lower body strong. Repeat other side. The purpose of self-inquiry is to experience the revelation of the true Self, not to probe mentally or seek a definitive answer. The practice is simple but not easy, and requires commitment and consistent practice to reap the incomparable bliss it bestows. Essentially, this is a practice of simply and repeatedly asking yourself the question, “Who am I?” and holding this thought alone, with a mind that is completely open and receptive to any responses or sensations that may arise. Breathing naturally, inhale to the count of four or five and exhale to the count of four or five. Consciously relax the body on the out breath. Scan your body and note any tension areas. Breathe into those areas on the in breaths and relax them on the out breaths. Continue for a few minutes until the body feels relaxed. Focus your attention in the middle of your chest in the spiritual Heart center. Inwardly and quietly and with an open mind and heart, ask yourself “Who am I?” without demanding or expecting a response. Maintain your focus of attention on the Heart center and breathe naturally. When thoughts arise, do not pursue theme or be captivated by them, but simply inquire of each thought, “To whom has this thought arisen?” If the answer comes “To me”, then repeat the question “Who am I?” From time to time, repeat the question in a relaxed way, without any expectation of an answer. The brow chakra is especially responsive to affirmations of our goodness and confirmations of our worth. Hatha yoga is the branch of yoga which concentrates on physical health and mental well-being. It is the yoga I teach. “Hatha yoga uses bodily postures (asanas), breathing techniques (pranayama), and meditation (dyana) with the goal of bringing about a sound, healthy body and a clear, peaceful mind.” http://medical-dictionary.thefreedictionary.com/hatha+yoga . The word hatha is a compound of the two Sanskrit words ha and tha meaning sun and moon. The Sun rules the visible world. The Moon rules the invisible worlds. http://essence-of-yoga.net/sun-moon-hatha-yoga-symbolism . This came to mind for me when we discussed the five elements and their connection to magic. Remember the connection to the Archangels— Michael, Archangel of the Sun, is linked with Fire, and Gabriel, the Archangel of the Moon, with Water. Connecting the visible world with the invisible world is what I’ve tried to do with this month’s focus on the magic of the “little people”. The third-eye/brow chakra connects the two worlds. When fully activated, this chakra stimulates both the right and left hemispheres of the brain. The right controls creative thinking, the left controls rational, analytical thinking. “Working together they create a harmonious vision of reality that incorporates grounded, logical thinking and intuitive and imaginative experience. The brow chakra offers us energy to awaken our minds and question whether what we have been taught is true or false.” The Book of Chakras, Discover the Hidden Forces Within You by Ambika Wauters. This is the perfect chakra for this month’s focus on allowing magic into our lives! The third-eye/brow chakra is located between the eyebrows and vibrates to the color indigo blue. The awakening of the third-eye chakra leads to clairvoyance or the ability to see on the non-physical planes…perhaps the ability to see magic? If you’ve been practicing yoga and meditation regularly for awhile (weekly at least, daily at best), you’re already a step ahead as this boosts your connection to self. It boosts your spirituality and enhances your mind. Meditation helps you move toward right brain activity which is a more relaxed state of bliss where we are all connected and one in the present moment. Right-brain thinking uses pictures and is very kinesthetic in how we process the moment. It’s all about energy and we are connected as “energy beings”. This type of thinking is a huge “leg up” on being open to allowing magic into your life. The right side of the brain is where imagination rules. In the link below, Jill Bolte Taylor, a brain scientist, describes the morning she had a massive stroke, and watched as her brain functions — motion, speech, self-awareness — shut down one by one. She literally speaks to witnessing her right brain hemisphere take over during some moments of her stroke, and then her left brain hemisphere would step in. She could distinguish the feelings between the two. It took her eight years to completely recover. Her realization of the effects of right hemisphere thinking and the idea that we all have it in us to choose to live this way motivated her to recover. She talks of “finding nirvana” when her right-brain activity took over. To loosely quote her summary at the end: “If I have found nirvana than everyone can and I can picture a world filled with beautiful, peaceful compassionate loving people who know they can come to this space at any time. They can purposely choose to step into the right hemisphere side of their brain. Who are we? We are the life force power of the universe with manual dexterity and two cognitive minds and we have the power to choose moment by moment how we want to be in the world. We can step into the consciousness of right hemisphere thinking where I am the light force power of the universe—the 50 trillion beautiful molecular geniuses that make up my being—at one with all that is. Or I can choose left—where I become a single individual separate from the flow, separate from you—intellectual. Jill’s dramatic event allowed her to see the magic of relaxing the analytical left brain hemisphere thinking. We luckily don’t have to wait for something that dramatic. We can choose to see the magic. We can choose to live at peace with the world and nature—which is one of the ways to open to the magic within it. The third-eye chakra’s “spiritual purpose is to offer us the possibility of wisdom, discernment, imagination, intuition, and knowledge. As we distill truth from life experience, we develop this chakra and strengthen our spirit.” The Book of Chakras, Discover the Hidden Forces Within You by Ambika Wauters. Just as the various books and experiences of my life opened me to seeing the magic of the glowing ball in my hearth mentioned in the first “yoga quote” section, it’s the development of your third-eye chakra through your personal life experiences that will direct you to your personal truth. If I had been open to only the analytical or logical side of my thinking, I would have completely discounted what my eyes were seeing, or perhaps I wouldn’t have seen it at all! It is in opening to the spiritual, emotional aspects of your experience that you develop your third-eye chakra. –both from Yoga Path Cards written and illustrated by Susan Woldman (and highlighted in my February 2010 newsletter!) http://www.yogalifestyle.com/DEUSSWYogaPathCards.htm. “Wisdom and discernment along with imagination intuition and knowledge are the qualities of this chakra. To distill wisdom from your life experiences, both good and difficult, and to choose life health, joy and fulfillment in every aspect of your life are aspects of this chakra.” The Book of Chakras, Discover the Hidden Forces Within You by Ambika Wauters. Just as Jill Bolte Taylor talked about the ability to choose to project peace into the world—to choose to step into right-brain thinking, we have the ability to choose to live in and be open to the magic of this wonderful world. That’s third-eye chakra development. Examine your self-limited ideas that make you feel “less than”. Strengthen your spirit through third-eye chakra stimulating activities like meditation or positive reflection/contemplation. Affirmations come to mind—see the ones below! The brow chakra is especially responsive to affirmations of our goodness and confirmations of our worth. Visualize the life you want. “The reason visualization is so powerful is because as you create pictures in your mind of seeing yourself with what it is you want, you are generating thoughts and feelings of having it now. Visualization is simply powerfully focused thought in pictures, and it causes equally powerful feelings.”—The Secret, Rhonda Byrne. Each morning as you awake, your brain is still in a receptive dream state. Visualizing first thing in the morning during this time is especially powerful. Transform your brow chakra energy by working with affirmations and visualization. I like to say in my yoga classes that “the inside you needs the outside you to take care of you.” I’d like to say I came up with that myself, but I know I didn’t. I constantly remind my students to listen to their bodies. How hard are you on yourself in general? Do you push yourself with unrealistic expectations? Do you compare yourself incessantly to others? That’s a sign of low self-worth and an under-developed third-eye chakra. Taking good care of yourself allows you to take good care of others—love yourself unconditionally. It’s how you keep your inner power glowing—your inner self worth. And it stimulates and strengthens your brow chakra! When you’re tired, learn to be extra gentle with yourself. I used to travel a lot when I worked for Rayovac. My territory was the west coast so my body clock was always off when I returned home. I learned to tell myself that all thinking was off-limits in this condition because I was tired, and when I was tired, nothing looked or felt good! Any time I’d start to go down the path of feeling sorry for myself or overanalyzing the trip, I’d simply say silently “Stop! Not allowed!” It worked and still does when I take the time to let my mind relax. If you can’t take a nap during times of weariness, do something extra special for yourself. One of my favorite comfort treats is a warm steamer at the local Caribou®. Giving your power away to others is another sign of a deficient third-eye chakra. Learn to question anything or anyone who negates your self-worth! The depths of indigo may seem unfathomable and mysterious, but they can yield useful perceptions. Indigo is related to clairvoyance, clairsentience and clairaudience (clear seeing, feeling and hearing) and other psychic skills. The deep, directionless depths of indigo can sedate the conscious minds to a degree where more subtle, delicate perceptions can be registered.” (Like seeing magic in your life.) Healing with Crystals and Chakra Energies by Sue and Simon Lilly. A healthy brow chakra encourages balance in the lower chakras which is why “many yogis begin chakra work at the brow center. It’s also the easiest chakra to rouse, often helps the other chakras to open, and once open, counteracts negative consequences of imbalance in other chakras.”Chakra Meditation by Swami Saradananda. Sounds like a great place to start! Breathwork and Visualization: Close your eyes and imagine the possibility of some kind of breakthrough in your life. It may be a personal breakthrough or it may be something related to the larger world. Imagine the effect your possibility would have on each of your chakras—feeling it in your throat, your heart, your belly, your sensations, and grounding it into the very cells of your body. Do this on a daily basis—running it from the top down—and see what actions you engage in that will help this vision come into manifestation. Add your deep, slow belly-breaths to the visualization to increase the energy in your body. As Rhonda Byrne of The Secret emphasized, it’s the feeling that stimulates the law of attraction, creating the life you want. To find your personal vision you must shift your attention from what is to what could be. Your vision of what is possible becomes the source of inspiration for your creativity and the guiding purpose for your will. Your vision can be large or small and both are necessary. You can look for better possibilities in your work, your relationships, or your community. It is also important to hold a positive vision for the larger world, and to weave that vision with the visions of others. Chakra Balancing by Anodea Judith. I think the very best of myself in all situations, at all times. I believe I am unlimited in my capacity for joy, healing, and happiness. I open myself to new energy, new people, places, and experiences. Every situation is an opportunity for growth and healing. I think positive thoughts about myself and everything around me. I open myself to my intuition and deepest knowing. I accept that I am an unlimited being and that I can create anything I want. I focus on what I love and draw it to me. I deepen my insight and expand my vision into the realms of timelessness. A Handbook of Chakra Healing, Spiritual Practice for Health, Harmony and Inner Peace, Kalashatra Govinda. Power Mudras, Yoga Hand Postures for Women by Sabrina Mesko. Diet and the Third-eye Chakra: Eating intentionally is an important element of diet for the third-eye chakra, as is dark blue/purple foods containing antioxidants which destroy free radicals in the body include eggplant, purple kale, blueberries, figs, plums, purple grapes, raisins, among others. Aromatherapy and the Third-eye Chakra: Scents that stimulate the third-eye chakra include: Hyacinth, Rose Geranium, Lemon, Vetiver, Basil (surprisingly relaxing), patchouli, rosemary, mint, and juniper, among others. Gem therapy and the Third-eye Chakra: Gemstones amplify the energy when placed in contact with your chakras. For those of you unsure on this subject, consider that it’s scientifically proven that everything is energy. Nothing is really solid. Why wouldn’t the energy of a stone work effectively with the energy in our bodies just as some research speculates that the energy of computers, cell phones, and microwaves may affect our bodies? At the very least, I find that holding a favorite stone is like a talisman for me, or a “worry stone”. As my favorite author, Wayne Dyer, likes to say, “If it’s a placebo effect, I’ll take two”. Some Third-eye Chakra gems are: Sapphire, tanzanite, lapis lazuli, kyanite, moonstone. As a reminder and in keeping with the “little people theme this month, elemental spirits of the Earth can be invoked through crystals, herbs, salt and bread. All yoga poses are essentially grounding and activate the chakras. The pituitary gland is located between the eyebrows and is traditionally called the “third eye” because it is the seat of intuition and clairvoyance. “It’s called the master gland because it secretes a hormone that specifically monitors the activities of the other glands in the body. Its basic hormones control skeletal growth and sexual development and maturation, as well as milk secretion in women. It has a strong influence on thyroidal and adrenal function. It controls blood pressure and is responsible for physical and psychological growth. When we are deeply attuned to our inner knowing, trusting our intuition and using our creative imagination, this gland works well. Our inner state of thought has a powerful influence on our physical well-being, as research is showing, and will affect our hormones and all our ductless glands.” The Book of Chakras, Discover the Hidden Forces Within You by Ambika Wauters. Inversions like the straddle forward fold highlighted this month! Inversions keep the “energetic nectar in the upper chakras, with the result that the body remains youthful.” Chakra Meditation by Swami Saradananda. There is a minor chakra known as the soma chakra, located above the top of your palate. “”this is the energetic center linked with the serene energy of the moon, and meditation on this chakra helps you to release tension and anxiety, cool anger and experience a peaceful, contented sense of calm. This chakra is said to be the source of a “divine nectar” of immortality that has the power to wash away impurities. This energetic nectar is thought to seep out of the “cave” or hollow space between the hemispheres of the brain. Most of the time, this youth-preserving nectar flows down through the soma chakra and the other energy centers beneath it until it reaches the solar plexus, where it is unfortunately “burnt off” by the solar-plexus chakra. Chakra Meditation by Swami Saradananda. One of the best ways to block the downward loss of energy is to practice another great inversion, Legs up the wall pose, highlighted in my January 2011 newsletter. Yoga postures and breathwork are intended as preparation for meditation—stimulating both the third-eye and crown chakras. Mudra means “seal” in Sanskrit. It’s a symbolic or ritual gesture using primarily the hands. Each position is believed to have a specific effect. Specific positions can lead to specific states of consciousness symbolized by the hand positions. For example, if a person frequently and with feeling does a position of fearlessness, they will also be freed from fearfulness in time. Mudras are said to engage areas of the brain and/or soul influencing them, sometimes physically, by their use—not unlike an affirmation, or reflexology for that matter. This month we are focusing on being open to viewing the world a bit outside the box to allow for some magic. So I picked the Mudra for Powerful Insight. Sitting in easy-seated pose, with your spine straight, bend your elbows and raise your hands to your belly button. A gentle fist is made with the left hand and it is placed with the palm side up into the palm of the right hand. You then cross your thumbs, left over right and concentrate on your Third Eye. Breathe long, deep and slow holding for three minutes. Affirm: I deepen my insight and expand my vision into the realms of timelessness. This mudra also stimulates the chakra of the month, the third eye charka which vibrates to the color indigo, and suggests one of my favorite mantras: Sat Nam which means “Truth is God’s name, One in Spirit”. Healing with the Fairies Oracle Cards by Doreen Virtue Ph.D.
Card Meaning: Your hearts desires are manifesting into reality. The fairies ask you to hold fast to your faith and expect positive outcomes. Good news! The life youve been dreaming of is becoming a reality for you. Your affirmations, prayers, visualizations, and other positive practices have brought your dreams to fruition. Now, the fairies ask you to keep the faith. At this moment, you may be seeing glimmers of your dreams coming true. These dreams are transitioning from thought-form to etheric form, and then theyre solidifying into material form. To make this transition successful and complete, your continued faith and prayers are needed. As God and the fairies to help release you of any fears that could cause you to sabotage your success. Know that you deserve this new abundance, and that it will bring much joy to you and those in your life. Affirmation: My heart is filled with gratitude and excitement, knowing that wonderful people and situations surround me now. Card Meaning: You are making big breakthroughs in your life by putting your Divinely inspired ideas into action. Trust that you are guided each step of the way. Those gut feelings, dreams and strong impulses youve been getting arent just examples of wishful thinking. They represent the germination of new projects and situations that are vehicles for your Divine life mission. Dont ignore these gifts from heaven, which come on the wings of repetitive, strong thoughts and feelings. The fairies ask you to honor your inner feelings by taking at least one step today in the direction of making your dreams and desires a reality. Fearlessly take one step to dismantle any part of your life that is out of integrity. Take another step toward realizing your hearts desire. Even a tiny step that is remotely related to improving your life will make you feel that youre soaring with the fairy realm. Keep taking one step a day, and soon your dream will be a reality. Affirmation: I move forward fearlessly, trusting that each step I take is perfectly guided. Description: Booklet and 44-card deck inspired by the book of the same name. Fairies are natures powerful guardian angels, and they can miraculously assist you with your self-esteem, relationships, health, and career. The fairies will help you find new inner strength and confidence, and guide you in treating yourself with greater love and respect. About the author: Doreen Virtue holds B.A., M.A., and Ph.D. degrees in counseling psychology; and is a lifelong clairvoyant who works with the angelic realm. Doreen is the author of Healing with the Angels, How to Hear Your Angels, Messages from Your Angels, Archangels & Ascended Masters, Solomon’s Angels, and the Archangel Oracle Cards, among other works. Her products are available in most languages worldwide. Doreen has appeared on Oprah, CNN, The View, and other television and radio programs; and writes regular columns for Womans World, New Age Retailer, and Spirit & Destiny magazines. For more information on Doreen and the workshops she presents, please visit www.AngelTherapy.com. Yoga benefits people with Rheumatoid Arthritis! Yoga may help lessen symptoms of depression among rheumatoid arthritis patients, according to a pilot study published in 2009. After 10 weeks of taking three 75-minute yoga classes per week, 16 female rheumatoid arthritis patients experienced significant improvements in symptoms of depression. Yoga also seemed to decrease perception of pain and improve balance. Also, according to a pilot study published in the British Journal of Rheumatology, people with RA who participated in a Yoga program over a three-month period experienced greater handgrip strength compared to those who did not practice Yoga. So this month’s recipe is from this wonderful book! As a reminder and in keeping with the “little people theme this month, elemental spirits of the Earth can be invoked through crystals, herbs, salt and bread. Irish Soda bread is ideal for those who avoid yeast because it is leavened with baking soda and baking powder instead. It makes great sandwiches, and it can be toasted for breakfast. Place a rack in the middle of the oven. Preheat the oven to 375 degrees Fahrenheit. Generously grease an 8 x 4-inch nonstick (gray, not black) loaf pan. In a large bowl, whisk together the sorghum blend, sugar, baking soda, baking powder, xanthan gum, and salt. Add the egg, buttermilk, butter, currants, and caraway seeds. With an electric mixer on low speed, mix just until thoroughly blended. Spread the batter evenly in the prepared pan and smooth the top with a wet rubber spatula. With a very sharp knife, cut a 1/8-inch-deep X on the top to allow the bread to expand as it rises. Bake until the top is deeply browned and the loaf sounds hollow when tapped, 55 to 60 minutes. The internal temperature should reach 205 degrees Fahrenheit when an instant-read thermometer is inserted into the center of the loaf. Cool in the pan on a wire rack for 10 minutes. Remove the bread from the pan and cool completely on the wire rack. Slice with an electric or serrated knife. Whisk the ingredients together until well blended. Store, tightly covered, in a dark, dry place for up to 3 months. You may refrigerate or freeze the blend, but bring to room temperature before using. You may double or triple the recipe. Since I own more than one faery CD, I had to share two this month! I purchased this CD at one of my favorite new age shops: Mind Body & Spirit Gifts & Books in downtown St. Cloud, MN www.mindbodyspirit-online.com. They carry stunning jewelry, stones & crystals, books & music, essential oils & herbs, candles & incense, unique gifts & artwork, Native American items, and relaxation & meditation CDs. They also offer Intuitive/psychic readings, body & energy work, classes & workshops, and guest speakers! A journey through an ancient forest. 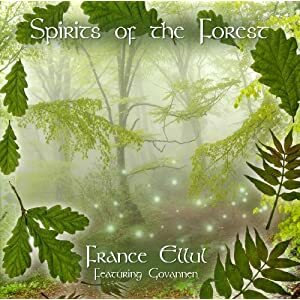 Featuring the outstanding Celtic group Govannen on tin and low whistles, violins, bodhran and guitars, while harper France Ellul completes his mythical Spirit Trilogy with Spirits of the Forest. Following a traveler as he makes his way through an ancient forest, the listener is taken into a magical realm inhabited by wood spirits that enlighten him with gifts of wisdom and tranquility. I purchased the following CD after noticing that literally every single song I hear from the group, Troika, I love. You wont be disappointed! 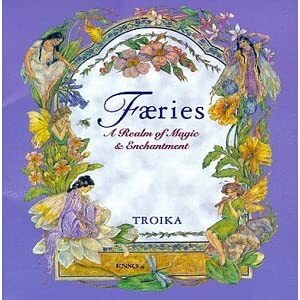 Just as faeries, elves, and leprechauns are sighted across the globe, this is a wonderful CD with eight gorgeous compositions with sounds from around the globe. Percussions from Ireland to India, Native American and bansuri flutes, harps and horns create the musical mystery and adventure of eight world faery tales. Evocative and sublime, these sonic landscapes will transport you into the enigmatic domain where faeries reign. Bonus! Each instrumental song has its own fairy tale you can read in the liner notes. Troika are a New Age group being lead by composer David Arkenstone. At Vita Bella we offer a holistic approach to revitalize your whole being by addressing the mind, body, emotional and spiritual self. Services include: aromatherapy; brain gym; emotional release; yoga; meditation classes; facial exercise classes; individual, family, couples and group therapy; and poetry therapy. April 8-10, 2011—The Energetics of Yoga Weekend Intensive with guest presenter, TeriLeigh! At Vita Bella Health & Wellness! TeriLeigh was barely ten years old when she performed her first yoga pose and discovered that her ability to see energy, auras, and chakras was a unique gift. By gaining a deeper awareness of the development and expression of the Chakra System, we can use our mind to create a reality within our body. In yoga, alignment of postures helps to open the energetic channels within the subtle body while at the same time producing physical benefits. Thus, aligning the physical body opens the energetic channels and creates a union between the spirit and body through the mind. Mind-Body-Spirit connection. TeriLeigh, over her whole life experience of seeing the energetic system, has determined that each of the seven major chakras habitually resides in one of four states: excessive, deficient, extreme, and balanced. As we strive for balance, it is good to know the current state of each of our chakras and how that affects our body’s functions, our moods, and our life in general. In addition, everyone has a “dominant” chakra, the major chakra and its power that represents this person’s life purpose or dominant power. Through this powerful vinyasa flow yoga practice, students will explore the seven major chakras of energetic system. Powerful yoga asana, spiritual affirmation, and energetic hands-on assists from TeriLeigh combine to create a unique and fulfilling experience of merging the mind/body/spirit connection. This series is designed to bring students’ awareness into their own chakra systems and help students determine which chakras are excessive, which are deficient, and what their dominant power chakra is. Although all yoga poses work each of the seven major chakras, specific poses will work to address issues within specific chakras. This series will work progressively, once chakra at a time, from the root to the crown, to address issues of excessivity, deficiency, and extremeness, to connect the chakras to work with each other, and to open the channels of energy for optimal flow. In TeriLeigh’s Energetics of Yoga Weekend Intensive, students will develop an awareness of the subtle energetic body through fun and simple energy activities, discussion and lecture, and experience in asana practice. Friday Night: Master Class, Saturday: Chakra Flow Workshop, Sunday: Body Wisdom Workshop. $275 for the weekend or $15 per hour pre-registration. So reserve your spot with payment ASAP! (See http://betterdayyoga.com/schedule/special-events for detailed breakdown.) Contact Sandyk@BetterDayYoga.com or call (612) 708-6900 to register “per hour” or use the link below to register for the full weekend. Private Consultations with TeriLeigh are available the week following the workshop. Please contact her directly: (651)357-4658. For more information please visit her Website: http://www.terileigh.com/.